This is a photo of the end-plates of the first 3 inch diameter fuel bundles. 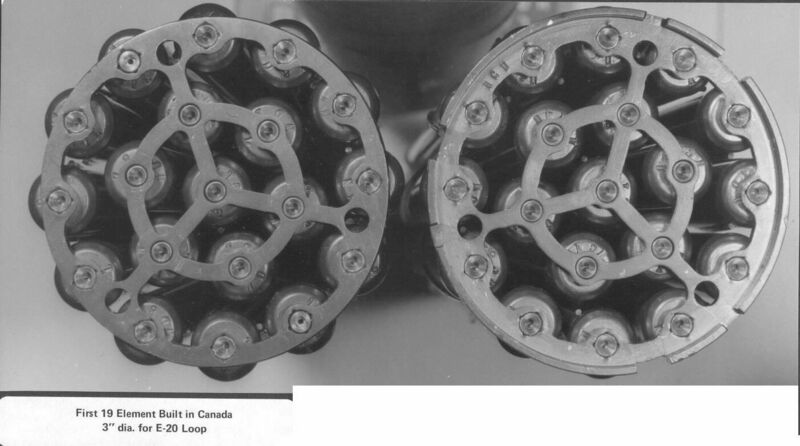 These were the first 19 element fuel bundles built in Canada and irradiated in the E-20 loop (now U-2) in the NRU reactor. They had to have a diameter of 3 inches to fit in the thick wall pressure tube installed in the E-20 loop to commission it. As the knowledge of the material properties of Zircaloy-2 was not well known at that time, the wall thickness was increased to be conservative. The bundles were assembled by screws as the method of welding the end-plates had not been developed. (circa 1959-60).